The unfortunate term "Brutalist" to describe an architectural style was coined in 1953 by English architects Alison and Peter Smithson. It is from the French béton brut, (raw concrete), a phrase used by Le Corbusier to describe the poured concrete of many of his post-World War II buildings. The style was popular in the 1950s through 1970s. The term "concrete block" is a phrase that occurs to many who try to describe it for the first time and to whom it may seem "cold", "impersonal", "totalitarian" and—the worst description I have ever heard!—"Führerbunker Bauhaus." Indeed, the style is very linear, although not necessarily so, since poured concrete offers possibilities for creating curves and various geometric designs (see photo, below, of the "Sails" of Scampia). Initially, the style was an outgrowth of modern architecture from the 1930s; it came into use for government buildings, low-rent housing and shopping centers to create low-cost, practical, functional buildings, but eventually designers adopted the style for other uses such as college buildings. Critics of the style point out that the material (concrete) does not "weather" well and that flat surfaces characteristic of the style are especially prone to vandalism. Examples of such architecture in Naples include the hotel at the Agnano Thermal baths (photo at top) from the 1960s, designed by Giulio De Luca (1912-2004), the main terminal of the Circumvesuviana train line in downtown Naples, the ENEL Towers, the buildings of the Second Polyclinic Hospital, and Franz di Salvo's "Sails" of Scampia (photo, right), put up between 1962 and 1975. I don't pretend to judge the aesthetics of architecture, but, as they say, I know what I like. I tend to agree with Tom Wolfe on some of this. He said in From Bauhaus to Our House (1981) that "modern" architects who thought that workers should live in "dwelling units" didn't understand that someone who works in a factory all day doesn't necessarily want to go home in the evening and live in one. There is something, to me, undeniably drab and grimy about a grey, rain-streaked concrete box of a building. On the other hand, the materials can lend themselves to non-linear geometries and even be adorned or painted. (That was the original plan was for the "Sails," mentioned above. You would live in a "White Sail," a blue one, etc. etc.) Also, with more modern technology involving the use of steel and reenforced concrete, there is additional flexibility, producing a sort of modified Brutalism that is, to my eye, not at all unpleasant. 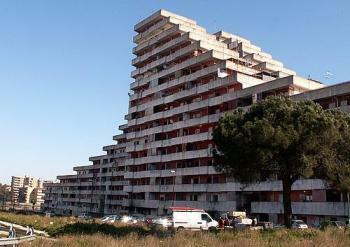 Thus, architectural styles change, but I am not sure if a style can "fail," as I have read of Brutalism. I know that certain buildings can fail, as is the case with the "Sails" in Naples (see that link in the above paragraph). That, however, has little do with the style of the buildings and more to do with the expectation that a "futuristic" design will automatically generate a sleek and modern future. They put the "Sails" up in the worst area in Naples in terms of crime, drugs and unemployment and then wondered why the buildings simply went to hell. An afterthought: If you look at the architectural history of Naples, some of the largest buildings were put up in the 1600s and 1700s. Certainly, extreme Baroque ornamentation disguised whatever "boxiness" there might have been in the buildings of Luigi Vanvitelli; his designs were meant to be regal and magnificent —and they were. One of his contemporaries, on the other hand, Ferdinando Fuga, built at least one very large box with flat surfaces—the "dwelling units" of his day. He was the go-to architect for large state structures (although he also designed other buildings more in the Baroque style of his youth). 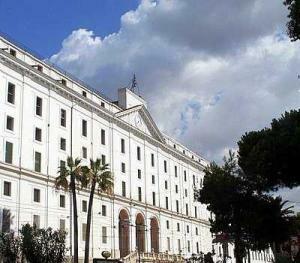 The Albergo dei Poveri (the Royal Poorhouse, photo, right) is a 1750 example of the 1950s—functional, practical and unadorned, meant to accommodate thousands of persons. It was so ambitious that it never got finished. Ferdinando could certainly have used some béton brut.